This card I'm sharing today....can I just say how much I love it? ;-) I'm not sure if I can bear to give it away! That's crazy-talk, I know. Why make a card if it'll just sit around? I don't know if any of you feel this way, but sometimes I keep a card for a while because I love the outcome. I like to look at it as I pass through my dining room (where I craft...and eat...and pay bills, and do work, etc. ), until one day, it's simply ready to go to someone special. See the black die cut behind the sentiment panel? I chose that because it reminds me of wrought iron, which is featured in the JUGS challenge inspiration photo (further below). Fancy wrought iron is something I've always been drawn to. They just don't make it like they used to! 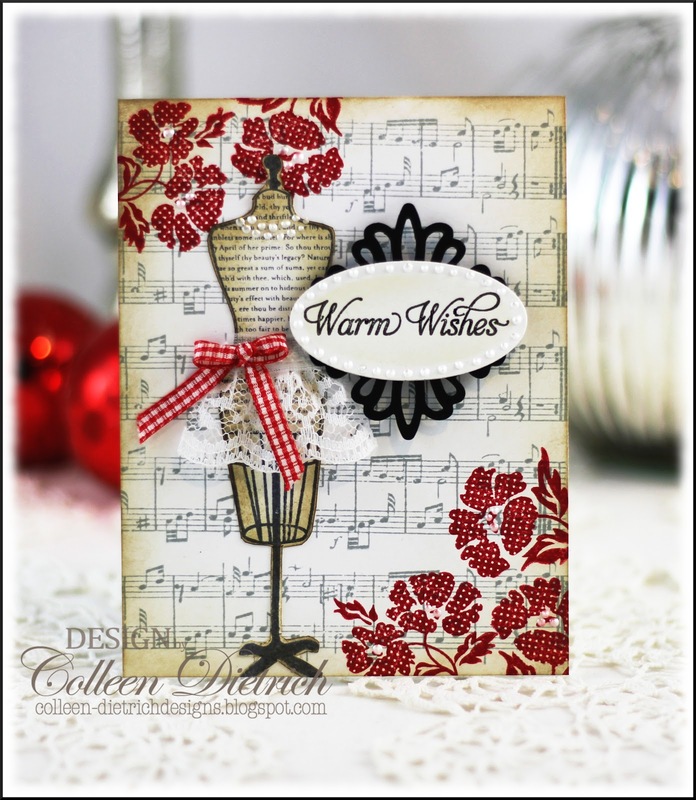 The sentiment is from Inspired By Stamping. All the best-dressed dress forms should wear pearls! Or, Liquid Pearls, in this case. The stamp is from Girls' Paperie, and it is wearing a lace 'apron' from my stash (it's gotta be, like, 20 years old already!). Has this ever happened to you? When I dot the White Opal Liquid Pearls onto an image that was stamped in red ink, the pearls turn pink! The ink isn't wet when I apply, but the 'pearls' still turn pink anyway. 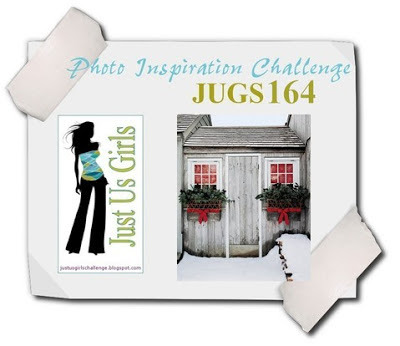 Just Us Girls - photo inspiration (above) - I took my cue from the red, gray and white color palette; the wrought iron planters beneath each window I interpreted with lacy die cuts surrounding the sentiment; red bows on the planters show up as a red bow on my dress form's apron. Shopping Our Stash - Odds 'n' Ends or Waiting to be used. I used a lace scrap that I've had FOREVER in my ribbon bag, and that little bow was in a $1.00 Scrap Bag from my Stampin' Up demo, already tied (thanks, Gail!). Simon Says Stamp and Show - 'A Project with Heart' - create a heartfelt card for someone dear to you, create a mixed media canvas with a heart focal point, use hearts as embellishments on your next layout, or art journal about what is dear to your heart. My project includes things dear to my heart: a shabby chic feel, some lace, some pearls, and a feminine touch. Do any of you have the November issue of CARDS Magazine? I have a card that is published in there, but cannot find a copy of that issue, so I don't know what page my "Give Thanks" card is on. I'd like to thank the gals at Papercraft Star for choosing my 'Pretty Pink Thanks' card as a runner-up. :-) That was nice news to receive today. And to each of you...I'm glad you came for a visit...thanks so much! Beautiful card en nice pearls on the card. 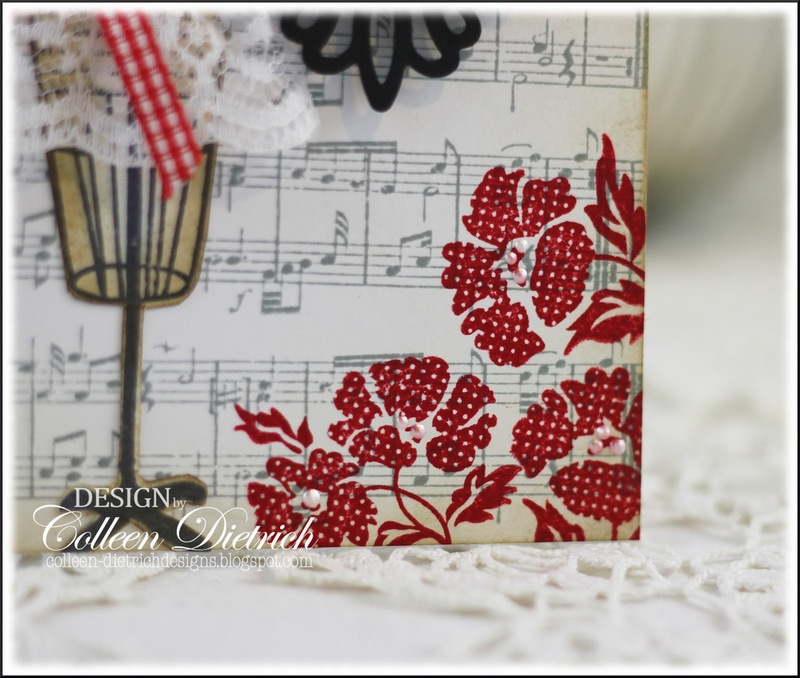 ANOTHER card of your's pinned, Colleen - I love it too..the mix of the music, dotty flowers (who makes them?) and the touches of ink to make it look old are a winning combination! 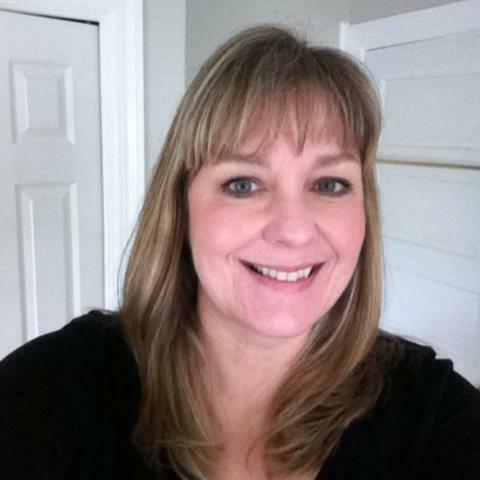 I love this too, Colleen---and I know just what you mean about not wanting to give a card away! I have a "special" collection of just those kind of cards! I LOVE that polka-dotted flower stamp...gonna have to look for that one myself! gorgeous..love the added pearls and the added lace...so cute..
Hey...when you get tired of looking at it as you pass by it...send it to me!!! LOL Really pretty colleen. Love the little dainty apron and those sweet polka dot flowers! Such a pretty card Colleen! 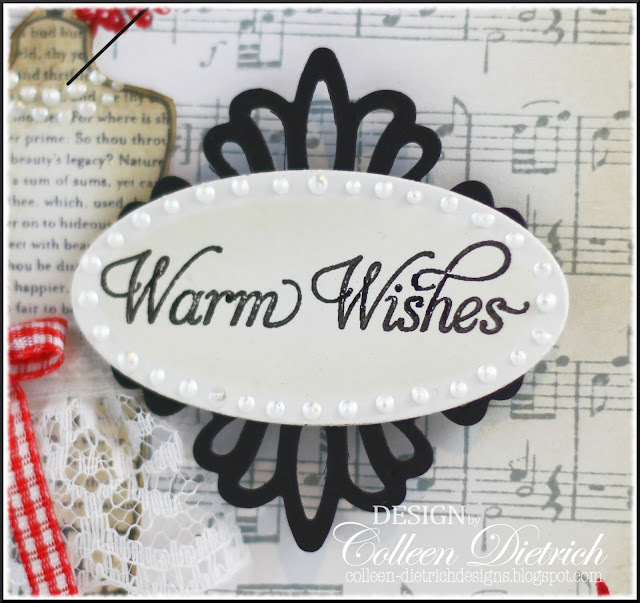 Love the liquid pearls and the black die cut!! Well, of course...if a dress form wears pearls, it has enough class to wear a lace apron. Your card is beautiful, Colleen. I love those red flowers. Maybe you should make another just like this one to keep because someone will surely love receiving this beauty. You did a stellar job on this card, Colleen!!! Great take on the inspiration picture and way to tie in the iron bars of the baskets. The lace and pearls is perfect and jsut love the red flowers. I can see why you want to hang on to it :) Have no fear, I do the same thing LOL! Great work and thanks for joining us at JUGS this week! Wowwwwwwwwww!! I can see why you LOVE it!! It is GORGEOUS!! LOVING the colors, the music paper, the dress form and the pearls!!! Yeah well, I certainly don't blame you for wanting to keep this around for awhile! This card is gorgeous!!! Love every single detail... you did a fabulous job on this one, lady! I LOVE it!!!! Oooo! 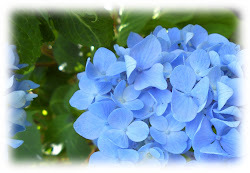 I love this one, too, Col, especially the color palette and those yummy, polka dot blossoms! So pretty! Hope you had a wonderful, Thanksgiving visit! Welcome back home, It is definetly life after kids!!! lol. LOVE this beautiful card and the colors and the details are so fabulous. I love wrought iron myself. I vote, don't give it away! Sometimes you gotta keep the stuff you make and love to keep you inspired. Oh, I have a few cards that I keep, and believe it or not after awhile I am ready to send on. This is beautiful! Congrats on all your wonderful accomplishments! No surprise though my friend! Congratulations on being published and having your card chosen as runner-up! Today card is magnificent. I love the mannequinn with the lace apron. I can see why you would want to keep this one around for a while! It is very awesome! :) Glad you had a good T Day@ Thanks for joining in with JUGS! This is SO pretty! I love the dressform, and the sassy little lace apron it has! Colleen, I'm in love with this card! I sometimes frame my little works of art & gift them that way. It warms my heart to see them displayed in friends' homes. Hey Colleen, thank you for the heads up on my win at Papercraft Star, and I return the sentiment! Congratulations to you, my friend... beautiful work! Congrats on being published. If I get out and about I will see if I can find a copy of Cards Magazine. Love the fact that this is a superb christmas card without being another boring xmas card. In fact it is amazing. Well, I can't say as I blame you for wanting to keep this card--it's a true work of art! Stunning!!! I saw this card on FB, and I my jaw fell! It's simply beautiful, Colleen. I love everything about it. This is gorgeous...soooooo pretty! I love the stamping on the text...I've been into dictionary pages so you've totally inspired me! Oh my goodness..I can see why you are loving it. It is absolutely beyond fabulous. Every last detail Colleen! Thanks so much for playing with us at Just Us Girls! Thanks for joining in the odds and ends challenge at Shopping our Stash....gorgeous card and I love the way you photographed it! How gorgeous- love the colors and the use of the lace! Thanks so much for joining us at Shopping Our Stash! 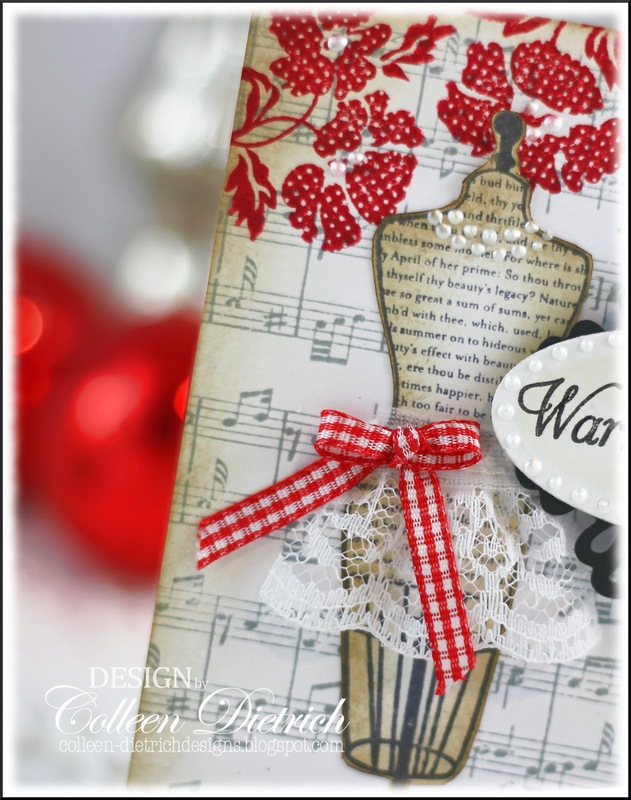 Oh, wow, I love the shades of black and white with the red polka dots and gingham! Perfect!